Tuesday, August 18th, 2015 at 7:31 am. 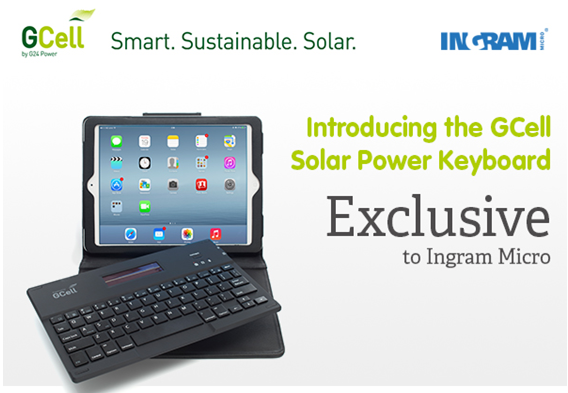 GCell is delighted to announce an exclusive keyboard and accessory distribution agreement with Ingram Micro, commencing with the introduction of the GCell Solar Power Keyboard Folio. GCell, the UK based disruptive technology manufacturer, is no stranger to this market having previously supplied solar cells to Logitech. Today they announce throwing a hat into the ring of manufacturing tablet accessories and distributing through the world’s largest wholesale technology products distributor Ingram Micro. With the introduction of the innovative solar powered Bluetooth keyboard the daily commute is set to get a whole lot less cumbersome. The sleek, compact and eco-friendly GCell Solar Power Keyboard Folio represents a new era for the commuting community. Instead of relying on batteries or an electrical socket the GCell actively draws power from ambient light. This lack of dependence on a mains powered charger offers commuters complete flexibility when it comes to using Bluetooth keyboards on-the-go. The product is compatible with the iPad Air and iPad Air 2, two of the most popular tablets on the planet. While Appleâ€™s latest tablet devices are incredibly useful the lack of keyboard does impact the overall user experience, especially when riding trains, buses or subways. GCell presents a next generation solution to the issue and allows users to transform devices into fully functional office or entertainment hub. Whether using a tablet for business or pleasure all commuters face the universal issue of rapidly depleting battery life.Â According to the latest research from Geometry Global a huge 89% of British commuters admitted to browsing and buying on portable devices during their commutes to and from work. A 2013 Randstad survey indicated the average British commute rings in at 41 minutes. Randstad maintains that the number of â€˜extreme commutersâ€™ who travel for over 90 minutes in each direction is on the rise. In fact since 2008, the number of â€˜extreme commutersâ€™ has almost doubled from just over one in twenty to just shy of one in ten. For workers facing such extended travel times the solar powered charge technology of the GCell is an incredibly valuable feature. A reliance on solar power means no interrupted browsing sessions, no lost work projects and no frantically trying to complete tasks before battery life is drained. In addition to its solar powered core the GCell boasts a host of futuristic features. The product itself weights a feather light 235g and measures in at just 6mm in thickness. This makes it ideal for British workers wanting to lighten their load. The magnetically attached keyboard can be removed from the folio and paired with other Bluetooth devices including smartphones and smart TVâ€™s. The Solar Keyboard Folio will be quickly followed by range of GCell branded tablet accessories, a solar backpack and a suite of wireless sensors in Q4 2015 and Q1 2016.